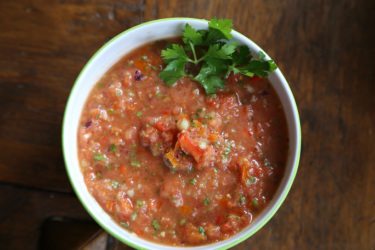 I found this fab gazpacho recipe online, and since it is super simple and looked delicious, I tried it. It takes roughly 5 minutes to make this, and it is sensational! I made it with roughly 500g of cherry tomatoes (not peeled or cooked), 1 lebanese cucumber, a reasonably large slice of watermelon, a medium sized spanish red onion, 2 red peppers (capsicums) and a handful of fresh coriander, plus the other ingredients prescribed in the recipe. The perfect meal to cool down on a warm summer's day and stock up on vitamins!